"Fury of the West's Most Lawless Feud!" This western has earned especially high praise for both is excellent, panoramic filmography and its well crafted musical track. 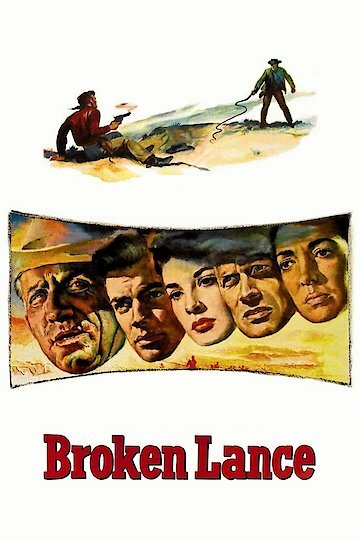 The movie stars Spencer Tracy as Matt Devereaux, a domineering, rigidly strict ranch owner, who married again following the death of his first wife. Both their father's attitude and his second marriage have displeased several of his four sons, especially Ben, the eldest (played by Richard Widmark). The other sons include Mike (Hugh O'Brian), Denny (Earl Hollimann) and Joe (Richard Wagner). Trouble arises when the old man's favoritism of his son, Joe, causes a conflict with Ben and the other children. Broken Lance is currently available to watch and stream, download, buy on demand at Starz, Amazon, Vudu, Google Play, iTunes, YouTube VOD online.